Gift Shop Website With 51 Revenue Streams! GreatGiftingIdeas.com is built with 51 Revenue Streams! Includes FREE Domain Name Transfer, Professional Webmaster Affiliate Link Integration, and 1 Year of FREE Hosting Service! NO Monthly Overhead Costs Whatsoever! 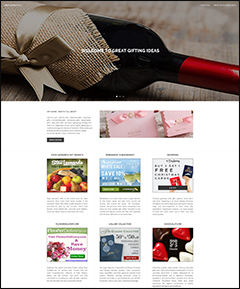 Winebasket.com is a family owned and operated business, large enough to handle orders for hundreds of baskets at a time, yet small enough to customize any order. Operating out of a 30,000 sq. ft. facility in NJ, they design and hand-make an extensive array of gift baskets, all beautifully presented in a variety of styles and colors.You will earn 7% commission on every sale! Your website links to DaySpring.com banner ads, which offer thousands of unique and personalized Christian products, gifts, and novelties. You will earn 12% - 18% commission on every sale. Flowerdelivery.com is one of the largest online florists and delivers the same day to the USA and Canada. The average order is about $65. You are paid a 20% to 23% commission on the sales from your website. Bonsai Boy is the largest supplier of Bonsai Trees and supplies on the internet offering hunderds of items at low wholesale prices. You will earn 20% commission on the sales through your website. 1-800-FLORALS is a premier site that offers hundreds of beautiful floral, plant, and gift basket products that are sure to please, with same-day and next-day professional florist delivery, ninety years of experience, and a name your customers can trust. You will earn 20% commission on the sales through your website. zChocolat.com has been rated "Top 5 Chocolate Gifts" by the Food Network and "Best Lesser Known Gift Site on the Net" by the Wall Street Journal. You will earn 20% commission on average order sizes of $80. What is the Canvas People Affiliate Program? CanvasPeople.com is the newest and most profitable way to turn your traffic into cash. You earn a commission when someone enters Canvas People through a link on your website and makes a purchase up to 120 days later... We pay our affiliates a generous per sale payout...Conversions are a breeze! $5.00 Flat Commission Payout!!! At SuperJeweler.com, we exceed the expectations of our customers. We provide Free Shipping, a Lifetime Warranty and a Money Back Guarantee to ensure a positive shopping experience for your site visitors, resulting in an extremely satisfied loyal customer base. As an Affiliate, you can earn 12% for every sale you refer; 14% for 3 or more sales; and, 16% for 5 or more sales. We use an extra long 120-day cookie and unlimited action referral occurrences to ensure you receive credit for your dedicated work. Welcome! At Timeless Message we provide a Romantic,Unique and Quality Message in a Bottle Gift unlike any other. Our dedication to customer service has served us well. We look forward to a mutual beneficial relationship with you. We currently pay a 15% sales commission . Welcome to the Red Tulip affiliate program, the only program in the Floral Industry that offers you 15% - 20% commission on every product you sell. The Red Tulip program will help add value to your website and not to mention a tremendous boost in revenue. Share-A-Sale - Hawaii Coffee Co. EARN ADDITIONAL REVENUE FROM THESE TOP PAYING SHARE-A-SALE BANNER ADS FROM Hawaii Coffee Co.
Click Bank pays you 50% of $29.95 commission on every download of "Start Your Own Gift Basket Business" from your website. Click Bank pays you 50% of $29.95 commission on every download of "The Baby Shower Kit" from your website. Click Bank pays you 50% of $50.00 commission on every download of "Candy Bouquet Designs" from your website. Click Bank pays you 75% of $37.00 commission on every download of "Candle Making 4 You" from your website. Click Bank pays you 50% of $17.00 commission on every download of "How To Give The Perfect Gift" from your website.